The huge influence of William Shakespeare around the world is clear to see when you talk to some of the proud Stratfordians joining this year’s 400th Anniversary celebrations from across the globe. They will be in town for the ‘Stratfords of the World UK Reunion 2016’ and the highlight of their busy programme will be representing their countries at the Flag Unfurling Ceremony, as Shakespeare’s 452nd Birthday Parade reaches its climax on 23rd April 2016. Every other year, six Stratfords from around the globe gather for a reunion and celebration of both their shared culture and unique qualities. Stratfordians from Connecticut USA and Ontario Canada set up a ‘sister cities’ programme of cultural and social events in 1985, shortly afterwards joined by their inspirational namesake from Warwickshire, then towns from Prince Edward Island, Canada, Australia and New Zealand expanded the group in the late 1990s. 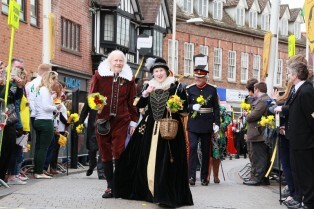 This year, from 20 – 26 April, Stratford-upon Avon will host around 140 guests for the special 400th Anniversary festivities including the Shakespeare Birthday Parade, in a week long programme of events, trips and warm Warwickshire hospitality. Such has been the enthusiasm for the 2016 event that two receptions will be necessary to welcome everyone. Breakfast or Afternoon Tea at the Town Hall will kick off the proceedings on Thursday 21 April. For delegates arriving and local host families providing accommodation or transport, the experience is an enjoyable one which has already resulted in lifelong friendships reaching far beyond the main Stratfords of the World reunions every two years. “The significance of the Stratfords of the World program is the creation of friendships that last over time and distance, appreciation for the way of life in other countries, the joy of sharing our lives and opening our hearts and homes to other ‘Stratfordians’. “Shakespeare has had a profound economic and cultural effect on Stratford, Ontario for more than 60 years through the creation of the Stratford Shakespeare Festival. “In 1952 our two major industries – steam train engine repairs, which employed 40% of our work-force, and furniture manufacturing were both disappearing. A young, local journalist, Tom Patterson, proposed the creation of a summer Shakespeare Festival and, with the encouragement of $125 from city council, headed to New York for advice. That led to a phone call to Irish director, Tyrone Guthrie, and Patterson’s admission that we knew nothing about theatre, was a siren call that drew Guthrie here. He would have carte blanche. Guthrie brought with him designer, Tanya Moiseiwitsch, and together they created the first thrust stage in the world after 1616. “The 1953 season productions were ‘Richard III’, staring Alec Guinness and ‘All’s Well That Ends Well’, featuring Irene Worth; the first four seasons were performed under a tent until the permanent Festival Theatre was built on the same site in 1957. “This season, there are four permanent theatres staging thirteen productions with the opening preview performance on April 19 and the final performance on October 29; it is now a $60 million industry.